– The National Avant-gardeassociation (hereinafter referred to as the Association) is a non-governmental and non-profit association, founded for an indefinite period of time in order to accomplish objectives in the areas of the promotion of civic and national culture and values, social development and solidarity among the Serbs. To develop the citizens’ (geo) political sense of the Serbian nation belonging to the Judeo-Christian and European civilization. Cooperate with universities, schools, professional associations and other organizations in the country and abroad which have the same or similar scope of operations. – The Association shall have a branch whose head office shall be in Novi Sad. – Any citizen of the Republic of Serbia who accepts the objectives and the Statute of the Association and submits a membership application to the Council of the Association is eligible to become a member of the Association. – The Council shall make the decision on membership termination and inform the member about the decision. To be timely informed about the operations and activities of the Association. To perform other activities entrusted to them by the High Council, the Council and the Assembly. – The bodies of the Association shall be the Assembly, the Council, the High Council and the Attorney-in-Fact of the Avant-garde. – The bodies of the Association shall also be the Boards formed by the Council in accordance with the rulebook. Decide on joining alliances and other associations in the country and abroad. – Decisions on amendments of the Statute, status changes and dissolution of the Association shall require a two-thirds majority of all the members of the Assembly. – The Council shall elect the Attorney-in-Fact of the Avant-garde from the ranks of the High Council. Decide on other issues which are not under the jurisdiction of other bodies of the Association pursuant to the law or the Statute. – The Council shall not have more than 13 members. – The mandate of each member of the High Council shall last until the Council dismisses them. Start initiatives for status changes and the dissolution of the Association which shall be submitted for a review and approval by the Council. – The High Council shall have an imperative mandate granted by a decree of the Council. The boards shall perform tasks appointed to them by a Council’s decree, within their jurisdiction. Attorney-in-Fact of the Avant-garde shall have an imperative mandate granted by a decree of the Council. The annual report and accounts of the Association’s activities shall be submitted to the members at the Assembly session. In order to accomplish its objectives, the Association shall establish contacts and cooperate with other associations and organizations in the country and abroad. The Association may join international associations, which shall be decided on by the Assembly. The Association shall acquire funds through membership fees, voluntary contributions, donations, presents, financial subsidies and other ways permitted by the law. The Association shall cease operations by a decree of the Assembly, when the conditions for the accomplishment of objectives of the Association no longer exist as well as in other situations prescribed by the law. In the event of the dissolution, the property of the Association shall be distributed to a domestic non-profit legal entity established in order to accomplish the same or similar objectives, i.e. the Assembly shall determine who the property shall be distributed to by a decree on dissolution and in accordance with the law. 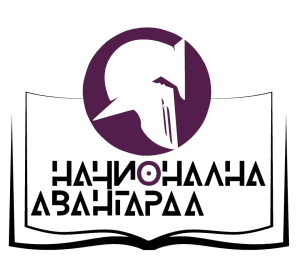 The Association shall have a square-shaped stamp with the drawing of a Hoplite helmet and НАЦИОНАЛНА АВАНГАРДА (the National Avant-garde) written in a book. The provisions of the Law on Association shall directly apply to all the issues not regulated by this Statute. This Statute shall enter into force on the date of its passing at the Founding Assembly of the Association.